Appetite is one of the notable changes that affect the elderly population. As a major need of their overall well-being, encouraging your senior loved one to eat well contributes greatly to acquiring their nutritional goals. In addition, the elderly years also put them at risk for common infections as their immune system begins to decline. Maintaining proper nutrition supplements the strength of their immune system. However, when your aging loved one struggles with appetite difficulties, how do you plan to assist them to recover? As your partner in providing quality Home Care Services in Brooklyn, New York, we hope you feel empowered with these tips that we’re going to share. Creating a routine for their regular meals and snacks orients your loved one’s mind to eat at a specific schedule. Even when their appetite doesn’t make the food attractive, the practice of eating contributes a lot for your senior family member to still avail good nutrition. The way foods are served also affect your loved one’s appetite. Large servings can appear intimidating and may discourage them to consume what you served. To avert this, prepare smaller portions of your servings but ensure that these are high-nutrient foods. 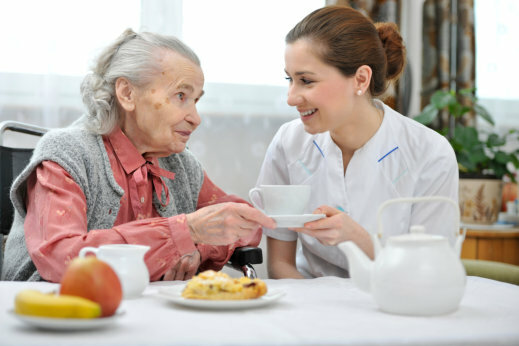 If you wish to coordinate with a licensed dietitian, our Home Health Care Agency can assist you. Some seniors may feel frustrated when they face difficulty holding spoon and fork. This scenario can discourage them from eating well. You can overcome this by preparing their foods in a way that doesn’t require any utensil. For instance, you can serve fish strips, meatballs, or steamed vegetables. Seniors who struggle with chewing and swallowing can also be enticed to eat in other methods, such as smoothies or shake. Preparing their food in a smoothie also provides a healthier alternative as you can prepare food in their concentrated form. You can also add in healthier ingredients and flavoring. Our Home Health Aide in New York can assist you when you need help. One essential step you can also take when it comes to your loved one’s appetite includes keeping track of their diet. Note down what foods have been especially appetizing or what strategies worked. Your diligent monitoring will equip you to be a better care assistant to your senior loved one. Stimulating the appetite of our aging family members can be a challenging experience. However, do not let this discourage you. You can explore different resources to learn from and you can also seek assistance from professionals who provide home care services to the five boroughs and Nassau County. Aside from assisting you with preparing meals, they can also ensure that your loved one’s nutritional requirements are being met. At F.A.B LLC Homecare Services, you can trust our team of care providers to supply you with highly qualified assistants from reputable healthcare professionals. For any of your inquiries, feel free to reach us out. This entry was posted in Appetite and tagged Finger Foods, Healthy Alternatives, Meal Routine, Smaller Portions. Bookmark the permalink.